Asian edition of the classical crossover act's 2001 album includes one bonus track, 'Viva! ', which is not included on the domestic version. Decca. 2001. Includes the bonus track 'Viva' not on the USA version. very intense interest in the music of there choice. I enjoyed them very much. I thoroughly enjoyed this CD. I read a review of it in a magazine over two years ago and I acted on a whim and bought it. I couldn't stop listening to it. Though I had never heard of Bond, I knew this was the kind of music to pass to my siblings, parents and friends. Once they heard it, they all went out and bought it. Next thing you know, these girls are on the "Today Show" and Leno and everywhere else. The driving rhythms are simply an electronic stage upon which these classical artists stand. This album is sheerly amazing. There are not enough words in the dictionary to describe the wonder of the music on this cd. It combines classical themes with a modern beat--a winning combination. I am in awe and envy of the talent displayed by these ladies (and their composers) and will continue to listen. I heard this group play on TV and decided to pick up a CD. In the process I discovered a new favorite. The selections are up-beat and make for great listening. I am convinced this Great Group of Girls will be around for along time. I applaud their choice and style of music, their appearence and their supurb ability. If u are a true sensetive music listener u will adore this Cd.When u see the girls u will love the CD even more. Don't be fooled! There is more to this CD than the girls! I love this CD. I reminds me of Vanessa-Mae's debut CD. I love how the ladies re-create classical hits into electrifying numbers. Whoever thought classical music could be boring? The first time I ever heard this group was in a truck stop restroom in Ohio. I knew immediately that this was one CD that I just had to have. I have become very interested in classical music spruced up by modern beats. I first got into this through the recordings of violinist Vanessa Mae. I used to play a string instrument, but I was a cello player, not a violin player; what makes Bond special to me is that this is a group of four string players, one of whom plays cello! The others play violin and viola. One of the best instrumentals I have ever heard. I'm Born again with Bond! Thanks, ladies! Bond provide the missing link between techno and classical music. The difference between this and albums like the Never Mind The Beethoven compilation is that Bond's album is techno-classical. The other is classical-techno. Get it? Got it? Good. The techno blast and the way the form a backbeat to the strings is simply outstanding and amazing, especially in "Quixote", and the lovely and danceable "Winter." Both the original version of the vivacious "Victory" and the truncated Mike Batt remix serve as breath of much needed fresh air. It was seeing the video for this song, the novelty of their sound, and the impish smile of one of the girls that led me to buy Born. Gay-Yee has a noteworthy cello solo in the middle of the epic "Oceanic." I'm not sure what the original tune to this was, but the way she and her comrades do this fantasy-like tune is sweet. "Kismet" is done in the same vein. Go! "Alexander The Great" is a majestic 2:59 burst of strings and techno, whose energy and brief running time parallels the all-too brief life of the Macedonian warlord who conquered the known world at that time. The violin, presumably Haylie, and Tania on the viola are the stars of "Duel." The melodic Eos-composed "Bella Donna" leads into their own take on Tchaikovsky's "The 1812," complete with the crash boom bam of the kettle drum/cannon finale. I'm not sure that Piotr Ilyich foresaw electric guitar and techno synthesizers as part of his overture. Wonder what he would think. "Dalalai" opens with an electric sitar, and has vague influences of Wolfgang Amadeus Mozart. "Hymn" is an soothing elegiac tune that should be played while one is relaxing in a patio chair sipping tea or lemonade, looking at the tranquil back garden. Second violinist Eos' quote in her profile coincides with me: "I love music that pushes boundaries..." Bond's music does just that, as she further affirms. Having played before the Queen and several Heads of States in her native Australia, she impresses me the most. Wait! I'm impressed with the others too! There are well over a hundred reviews on the CD page for this album, with widely varying evaluations. Some people hate it (including the Amazon editor), and some love it. My wife would hate the strong dance beat, but I appreciate the addition of rhythm instruments to Classical Crossover, even if it is a synthesizer. In the case of "Born" the beat seems to dominate the music a bit too much, but some people will like that. So if you want to listen to a fast-paced string quartet with a strong dance beat, this is your ticket. 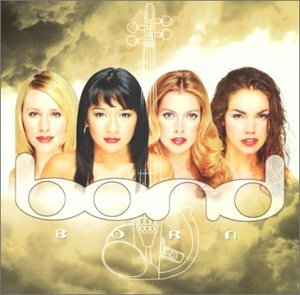 Having purchased Bond's "Remixed" CD as my initial exposure to the group (see my review, "Junk", for that CD), I took a number of other reviewers' advice and bought the "Born" CD. This is what I had in mind! While still relying to a considerable extent on "techno" augmentation, the group's individual artistic talents are more evident and highlighted on this CD. Going in, you have to understand and accept that Bond's style is not in strict adherence to typical classical motifs. But the "Born" CD demonstrates a significant level of innovation,energy and dedication to this particular style. Not every track is a winner. "Kismet", "Korobushko" and "Alexander the Great" are especially unique and memorable in their combining of various ethnically evocative themes. You'll sense a bit of Greek, Gypsy, Russian and Yiddish influences. On the other hand, the "1812" track is pointless and a waste of plastic. 01. Quixote - 9/10 This is a really cool song, whose only flaw is the annoying vocal in the beginning-- but that's just my opinion. Great way to start of album. 05. Kismet - 7/10 This song would be better without the weird sound effects (like a UFO landing) without the sound effects, it would be a 10/10... Excellent job by Gay-Yee! 06. Korobushka - 7/10 It is pretty good, but it takes too long to speet up. 07. Alexander The Great - 9/10 It is really really good! 09. Bella Donna - 5/10 It is okay, but it isnt their greatest song. 10. 1812 Overture - 11/10 THIS IS THE BEST SONG EVER!! it starts slow and it speeds up perfectly, but the only flaw is the pitch and speed drop. The live version (on the DVD) is so much better because they cut it out. 11. Dalalai - 7/10 It is pretty much an okay song with a slow beat. 12. Hymn - 9/10 It is really good, and it is pretty much the only track without percussion. 13. Victory (mike batt mix) - Like I said, I hate this song, and the electric guitar doesn't help either. I first seen Bond in T.V. It's their live concert in London at the Royal Albert Hall. It was a very great one, having string quartet playing classical melodies and modern type of music whatever you call it. Their album Born which sells over two and a half million copies especially around asia. Someone really cooked up a dish here, with a fine concoction of ingredients, simmered to a glossy shine. It is "Lite" all the way, with a mixture of gypsy-Spanish-new-age-classical-Middle-Eastern-pop, and borrows from so many sources it makes one's head spin. With four beautiful women as soloists: Haylie Ecker/First Violin; Eos/Second Violin; Tania Davis/Viola; Gay-Lee Westerhoff/Cello, and a large orchestra to back them, this reminds me a little bit of Yanni's Acropolis venture, but with less cohesion, less genuine creativity, and more packaging. All the tracks are pleasant and would make terrific background music, with the exception of # 10, "The 1812". I find the original Tchaikovsky composition hard to take, and this version is over six minutes of aural pain. There are 2 cuts of "Victory", the marvelous tune used for the television ad that made Bond so famous. It was perhaps the only ad in history that many of us increased the volume on, rather than using the mute button. Bond's debut albumn "Born" offers an interesting fusion of classical and pop sounds with a new age spin. Bond, a "created" group of four classically-trained instrumentalists, performs excellent music for a wide audience.